We will be covering all available types of parameter sources in the following sections – all that you need as a prerequisite is Java ™, Maven and a few minutes of your time. How parameterized tests are written with JUnit 4 is explained in the following article of mine: “New features in JUnit 4.11“. junit-jupiter-engine: Public API needed for writing basic tests. junit-jupiter-params: Dependencies to write parameterized tests. In addition, we’re adding the dependency junit-platform-surefire-provider to the Surefire plugin so that we’re able to run all tests with Maven in the command-line. A value source allows you to directly specify the parameters as annotation attribute. Parameterized test using value sources. This parameter source allows us to pass in the values of a given enum and additionally restrict which of its values are passed in as parameters using restricting lists or by matching the values to a regular expression. This parameter source allows us to reference a method that provides the input parameters. The referenced method must return either a Stream, an Iterator or an Iterable. 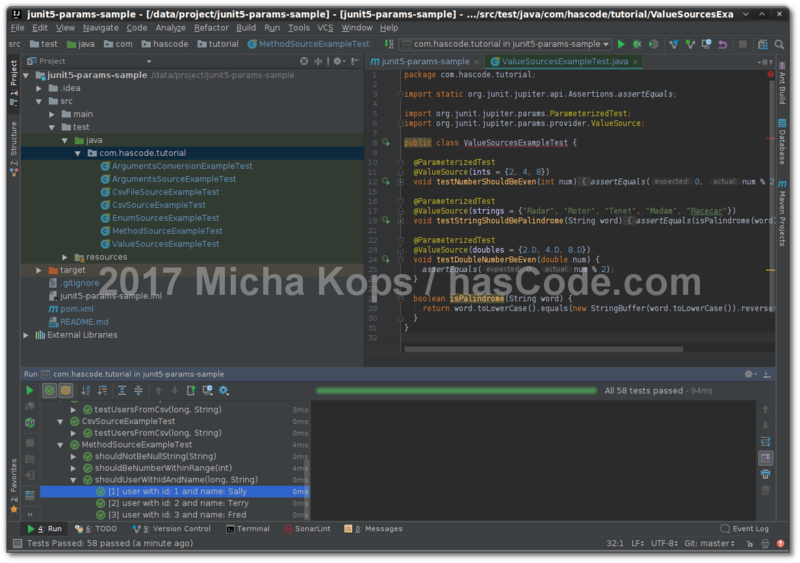 This parameter source allows us to reference a Java class that provides the parameters for the test run. The providing class must implement the interface ArgumentsProvider, so we need to implement just one method that returns a stream of arguments. This parameter source allows us to specify arguments using strings with comma-separated-values as annotation parameters. In addition to the CSV source, we may also specify a file that contains our test arguments as comma-separated-values. JUnit allows us to convert arguments to the target format we need in our tests. JUnit offers multiple built-in type converters, especially to convert between strings and the common value types as this is needed for the CSV sources. For more detailed information, please refer to the JUnit User Manual here. If we want to control the conversion or we need to convert to a type that is not in the list above, we may use the annotation @ConvertWith(MyConverter.class) for our argument and let our converter class implement SimpleArgumentConverter. The following example shows a converter in action that converts between a string and an UUID. [ERROR] [Help 1] http://cwiki.apache.org/confluence/display/MAVEN/OutOfMemoryError” There was an issue with the Surefire-plugin, also documented in https://github.com/junit-team/junit5/issues/855 – upgrading the versions should help. This entry was posted on Saturday, August 19th, 2017 at 6:23 pm	and is filed under Java, testing. You can follow any responses to this entry through the RSS 2.0 feed. You can skip to the end and leave a response. Pinging is currently not allowed. Thanks for this blog post! Parameterized tests was always one of the weaknesses of JUnit. I like the changes in ver 5, but I think I will still stick to Junitparams (http://pragmatists.github.io/JUnitParams/).